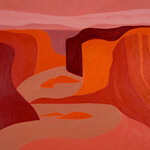 Home » Galleries » Past Shows » 2011-2012 » Kristin Wigley-Fleming Fine Arts Gallery, Center for the Arts » "Canyon de Chelly"
There will be a Gallery Reception held on Saturday, November 5, 2011 from 2:00 - 3:30 p.m. All are welcome. Laura Hampton is a 1980 Luther College graduate with an art major. 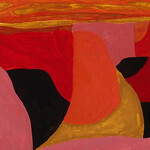 She received her MFA in painting from the University of Iowa, Iowa City in 1987. 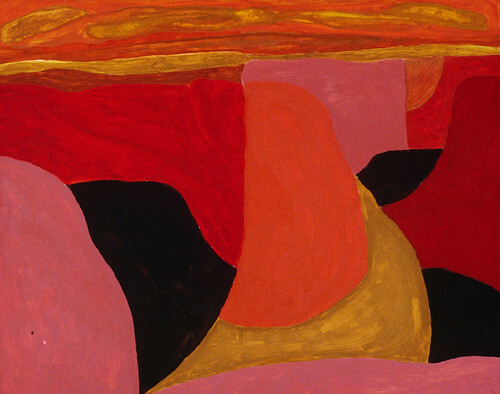 In addition to her studies at Luther and University of Iowa, she attended the Pennsylvania Academy of Fine Arts in Philadelphia from 1980-1982. While at the Academy she was awarded the Nicolas Buccarelli Prize in Drawing. 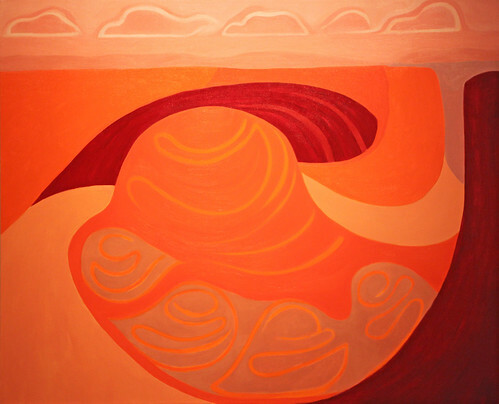 Following graduate studies at the University of Iowa, Laura and her husband, Charles Beile (Luther ‘80) moved to Minneapolis, with the intent of becoming a professional artist. 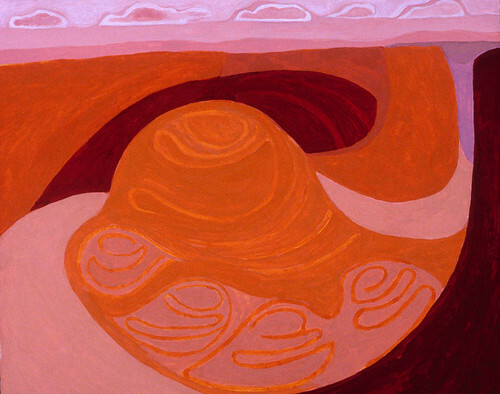 She initially supported her artistic life through working part time in art museums, including the Walker Art Center and Minnesota Historical Society. 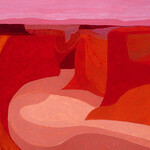 In 1994, she began exhibiting her work with the Groveland Gallery in Minneapolis. 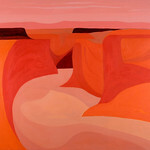 Her most recent solo exhibition was held at the Groveland in April 2008 and featured twenty paintings of Canyon de Chelly. 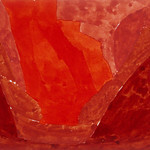 Her work has also been exhibited in Santa Fe with Cline Fine Art, a specialist in Early Modern American Art. 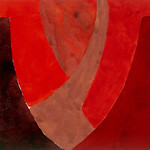 Laura’s work is held in prominent private and corporate collections nationwide. In 1996, she and her husband purchased the south Minneapolis home and studio of Stanford Fenelle (Minnesota WPA/Artist) where she works daily. 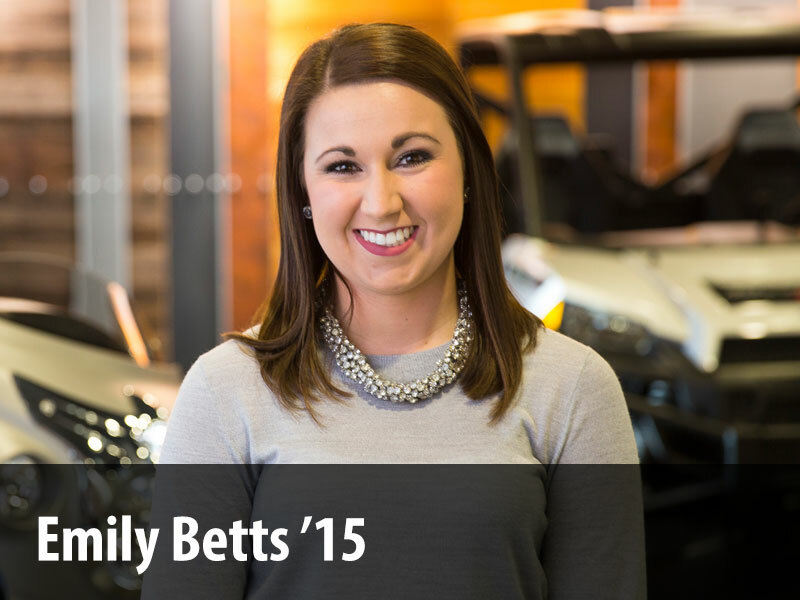 In addition to her work as a professional artist, Laura teaches part time on the collegiate level. 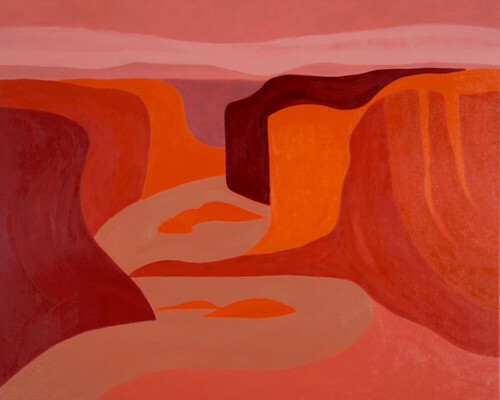 Since 1994, she and her husband have spent their summers on the Navajo Nation where she teaches painting and drawing at Dine` College. 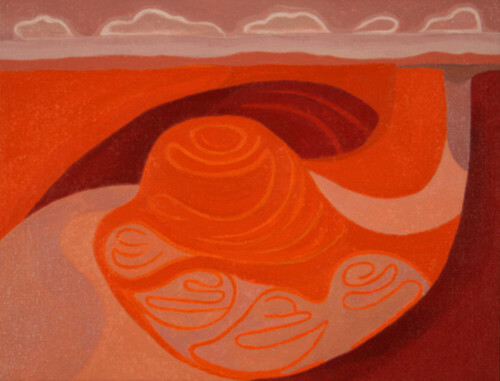 The experiences amidst the Navajo culture and in the Southwest landscape have richly inspired her work through the years. This past year (2011) Laura and Charles joined a small group of Navajo friends and colleagues on a trip to Peru. The group visited archeological sites of the Chimu and Chavin cultures pre-dating the Inca on the Northern Coast of Peru; visited museums and sites in Lima, Trujillo and Cusco; spent ten days in the Sacred Valley in Quecha (Inca) communities of Ollantaytambo, Patachanca, Chinchero and Pisac; and completed the trip with a pilgrimage to Machu Picchu. Laura returned home richly inspired by her experiences and is excited to see what unfolds in the studio in the coming months. In addition to teaching on the Navajo Nation, Laura has taught in the Twin Cities at the College of Visual Arts, Minneapolis College of Art and Design Continuing Studies Program. 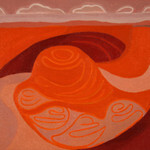 She served as a guest lecturer on the work of Georgia O’Keeffe; and was on an artist’s panel during an exhibit of Marsden Hartley, both for the Weisman Art Museum at the University of Minnesota. 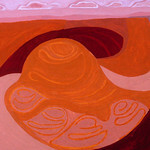 In the spring of 2006, she was invited as a guest artist and critic to the Graduate Painting Program at Hartford School of Art in Hartford, Connecticut. 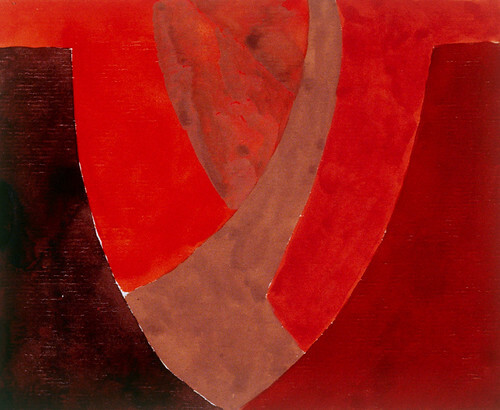 She returned to Luther College as visiting Professor of Painting while Doug Eckheart was on sabbatical in the fall of 1991. 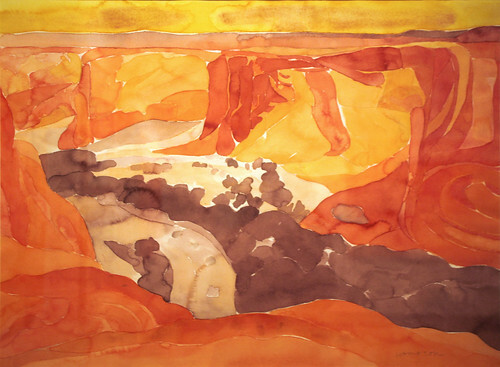 "In this body of work I have given attention to a very special place in my personal experience, Canyon de Chelly. 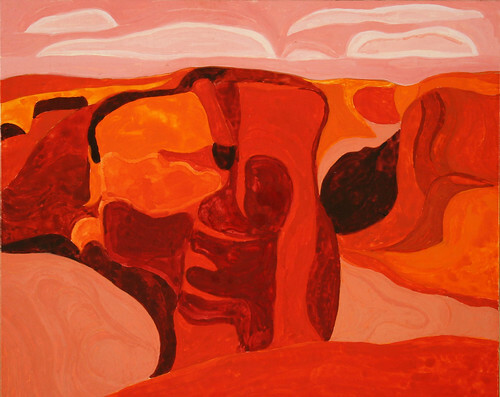 Over the course of the past sixteen years, I have spent my summers on the Navajo Nation in NE Arizona teaching painting and drawing classes at Dine’ College. 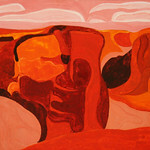 In that time I have had many opportunities to hike, explore and to paint at nearby Canyon de Chelly. 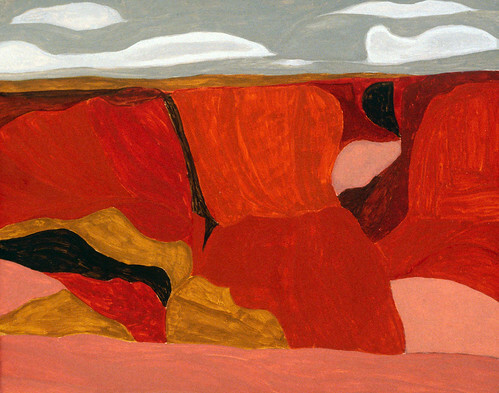 The paintings in this show were preceded by numerous works in oil, watercolor and gouache. The very earliest studies included some two dozen watercolor studies done on site since 1994. 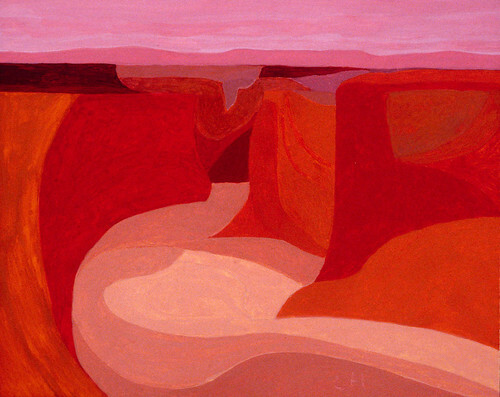 During that period the “canyon” images that were accumulating were not the focus of my work in the studio, but were beautiful studies and meditations that I took great pleasure in creating. After all, the work allowed me many, many solo trips to the canyon to spend time sitting, listening and gazing into the canyon. 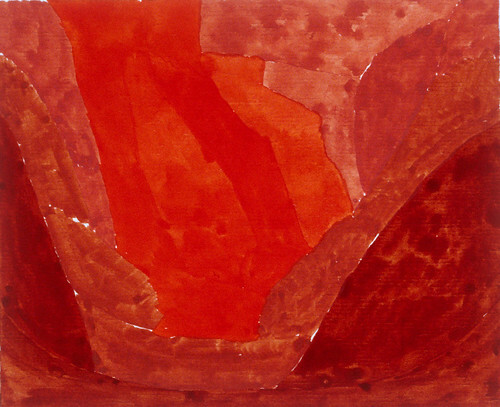 These small watercolors eventually found their role in the development of the work that took shape beginning in 2007. 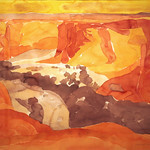 It began upon the return from the Southwest that year in my Minneapolis studio with one tiny 4”X6” watercolor study of the canyon that I pulled right out of my head. From that tiny abstract painting, the process of distillation began with large black and white, ink and yucca reed drawings referencing the early watercolors. The simple line drawings kept moving along with keen interest and excitement. Gradually I came back to address color, first in the form of turquoise blue and then with a palette of siennas, oranges, yellows, alizarin and cadmium reds. They looked nothing like my little meditations done at the canyon. Numerous paintings developed later in my Minneapolis studio and have led me into the new work that is essentially held in my mind and soul: the spirit of a place. I have in one sense let go and roamed. Much formal attention has been given to the works’ development: the distillation of line and shape; the compression of space; the attention to the function of color, whether local or emotional; and finally the exploration of scale as it relates to subject and overall composition. Drawings, watercolors, and gouache studies have all played their role in the arrival of these new oil paintings. At the heart of the work is the search for the poetic essence in things as experienced, remembered and imagined in a very extraordinary place. "Located in the heart of the Navajo Nation, Canyon de Chelly is situated in the NE corner of Arizona and extends together with its tributary, Canyon del Muerto, some forty-five miles in length. To the canyon’s east lie the Chuska Mountains (10,000 feet in elevation) which seasonally send spring snow melt and summer monsoon rains snaking through the canyon’s floor of sand loam and clay. The scale of Canyon de Chelly is difficult to imagine in one’s mind. The regional elevation is between 5,000 and 6,000 feet. Rock walls at the mouth of the canyon near the community of Chinle are about thirty feet high, rising as the canyon progresses upstream to as high as 1,200 feet. 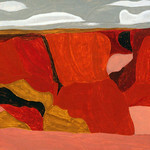 From the numerous rim overlooks, the space is deep and vast; the canyon’s rock walls stagger infinitely to the horizon. The dance of light throughout the day changes the canyon continuously; the arrival of a summer storm adds more drama to witness. It is a magical and engaging place to experience. In the briefest description, the walls of the canyon are copper to cinnamon orange, streaked with black stains of desert varnish. The geological formation making up the canyon walls is known as de Chelly Sandstone. The canyon’s floor is equally beautiful in its qualities of color and texture. 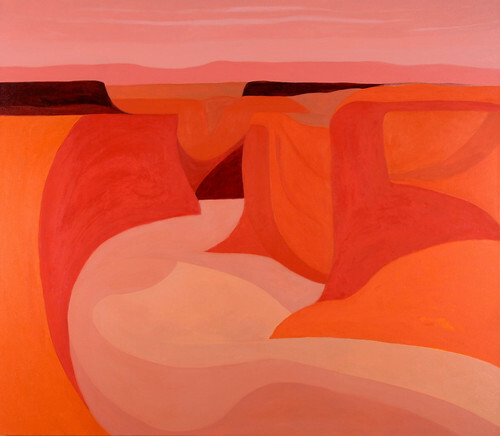 Depending on the light, pale sweeps of pink, orange and violet sand are textured with high desert vegetation of green sage, pinion, ponderosa and cottonwood trees. While an arid, dry and still canyon before one’s eyes, there is an overall feeling of movement akin to that of a meandering river. If you are lucky enough to see the spring and summer rains flow from the Chuska Mountains, you witness the very element which carved this canyon over the many years. My husband and I once lucked out to be at the canyon rim to watch the arrival of the water from the afternoon’s heavy rainstorm in the mountains; we watched as it crept slowly through the sand. We then hopped in the car to travel downstream and kept just in front of the water’s arrival at two other overlooks before finally arriving at the mouth of the canyon in Chinle! In addition to the natural phenomena, the canyon today is home to some seventy-five Navajo families. As you sit at any of the rim overlooks you can see below one or more family summer home sites occupied and continuing a way of life that goes back many generations; planted cornfields and peach orchards, herds of sheep, horses and cattle freely graze the canyon floor. The cultural cosmology and history in the canyon is rich and easily accessed with a Navajo guide and trustworthy 4x4. Hundreds of documented archeological sites exist; Anazazi ruins, pictographs and petroglyphs left by the Anazazi, Hopi and Navajo. In more recent history, it is also in Canyon de Chelly that Kit Carson and his men burned down peach orchards and starved to death many descendents of the Navajo families living in the canyon today. Those whom survived the U.S. Government raid were forced to march to Fort Sumner, NM on the Long Walk. The canyon abounds with story and history, all of which layers my experience in this very special place. "The artist life is the richest and most adventurous journey I can imagine. It is a discipline filled with challenges and demands that make me grow each day. The act of painting as a daily discipline is outside the realm of contemporary life for most people. Even young art students are not capable of truly imagining the artist life. What could one do, day in and day out, alone in the studio that could be so worthy of the sacrifices that come with being an artist? While I do not pretend to have answers to life’s deepest questions, I am free and it is my job as an artist to engage philosophically and spiritually in every avenue of the human experience. 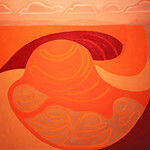 That is simply what I do; I live a life of engagement and communicate that experience through the language of painting. As all art through history reveals, the most significant understanding we have of a culture and period in time comes through its art. My efforts, however humble, are part of the larger collective contributions artists make to give voice to the human experience of our own time. "With all the excitement at Luther this year exploring elements of transformation and journey, this is an opportunity to turn and look at the creative process. My own body of work, like every creative effort, is a great example of how “transformation” is at the heart of our creative work. It is evidence to: 1) a departure - an idea or experience begins a journey; 2) a journey begins - we often speak of stepping into the unknown, the search, the risks, the failures and the solutions; 3) finally, an arrival - we in a sense “arrive” when we have finished work. And then the process begins all over again. As artists we are agile and in flight, searching on a daily basis. After all is done, we hope for honesty in our work (originality) and freshness (transformation)."